How an employee of Delhivery started his own venture “PepperTap” in hyper-local delivery marketplace? 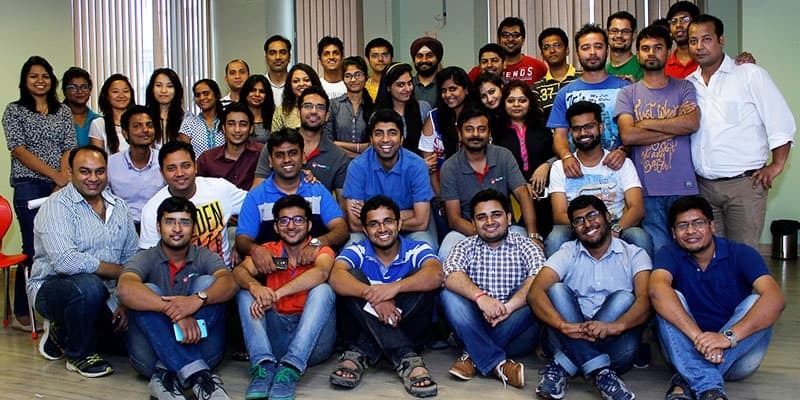 PepperTap is an on-demand grocery delivery service in India based out of Gurgaon. It kick started its operations on 26th November, 2014. It is a location based platform wherein goods are procured from already tied-up supermarkets. This allows customers to see a specific catalogue of their area based on their location. After a fiveyear work at the UKbased distressed debt servicing company Validor Capital, Navneet, the founder of PepperTap joined Delhivery to understand the logistics space in e-commerce industry and hence further served the Gurgaon-based logistics firm for nine months. Moving forward, Navneet partnered with Milind, who met him at Delhivery and the duo started e-commerce focused reverse logistics company Nuvo Ex. Navneet says, “The demand from clients drove the duo to expand the company to five other cities”. While running Nuvo Ex, the duo discovered a big opportunity in grocery-focused hyper-local play and raised seed funding for PepperTap on an idea level. “We leveraged Nuvo Ex’s success while pitching PepperTap to investors. This worked in our favor, Sequoia gave us seed round and we started PepperTap on December 20th,” says Milind. [su_box title=”More startup of the week chosen by DSIM:-” box_color=”#c7c7c7″ title_color=”#000000″ radius=”5″]1) How a trip to Leh-Ladakh led the foundation of TravelTriangle? 2) How Qyk is spreading its reach Local Service Marketplace? Why we choose PepperTap as Startup of the Week? • The company started its operations on November 26th 2014 and has grown from 10 orders a day to 1,000+ orders a day since then. • The company’s business model is unique to India and similar to Instacart in the US. It is a location-based platform wherein goods are procured from already tied-up supermarkets. • On a week-on-week basis, the company gets repeat orders varying between 40 to 55%. • PepperTap as a startup, on most recent weekend sale was able to clock more than 14,000 orders per day across the country with the GMV greater than 1.2 crore. PepperTap does over 275 crore GMV on a monthly basis. Besides NCR, the Gurgaon-based startup has its presence in other metros like Pune, Hyderabad, Chennai, Bangalore and many more. “Our main competitor Grofers has a horizontal approach towards hyper-local deliveries as it delivers grocery, bakery products, electronic accessories, and flowers etc. while we have a niche approach towards grocery and fruits,” states Milind. PepperTap is growing big with increasing number of orders per day. Their business is supported by team strength of 1000+ employees. Currently, PepperTap features over 10,000 grocery products from retailers listed on its website ranging from food mart, grocery & staples, fruits & vegetables to household. It has extended its categories to include meats, dog food and cosmetics as well. The company has been constantly upgrading its operations in order to provide a seamless, hassle-free and swift shopping experience as per customers’ requirements. On the most recent weekend sale, PepperTap was able to clock more than 14,000 orders per day across the country with the GMV greater than 1.2 crore. Navneet states, “On the lines of Grofers, PepperTap also doesn’t want to get into the food delivery space. “Food delivery works on a very short notice i.e.30 mins deadline and we aren’t geared to deliver at such a fast pace. Also we want to keep all our focus on grocery”. To gear up the business, the company raised two rounds of funding from Sequoia and SAIF Partners.The seed funding helped the company to carve a niche in the market and become the beston-demand grocery delivery brand that offers impeccable services across the country. The company recently received Series A funding of $10 million in April which is being leveraged to put in place a highly-skilled team that is in sync with global standards and to enable sustainable city-wise expansion. “Currently, we have enough cash but as we expand to major cities this year, we may need a round for quick presence in bigger cities,” concludes Navneet. PepperTap has established its presence in the high potential markets of Delhi NCR, Hyderabad, Pune, Bengaluru, Chennai, Chandigarh, Jaipur and Kolkata. It recently expanded its orbit to cover Kolkata and Chennai and is set to bring Surat, Lucknow, Ahmedabad, and Vizag with a total of 30 more cities within its fold by the end of 2015. These cities will include tier-1, tier-2 and all the capital cities of the country.